This small Southern town just 20 miles north of Charleston came into being in the late 1700-s during the heyday of Lowcountry rice cultivation. To escape both the oppressive heat and humidity of the coast, upscale Charlestonians built seasonal cottages, which have now become the genesis of modern-day Summerville. The town-s settlers attributed the lower incidence of mosquitoes to the many pine trees abounding in the area, and thus began Summerville-s love affair with its indigenous pines. To this day laws prohibit the cutting down of these "fever-preventing" trees. In the Victorian Age, the International Congress of Physicians declared Summerville as one of the top two places in the world for sufferers of lung disorders. At the time, the prevailing medical belief was that the powerful scent of pine trees, which Summerville had in abundance, contained special healing properties. Thousands with respiratory ailments flocked to Summerville, and many of these patients fell in love with the intrinsic beauty of this small town. These lowly local trees are even honored in the town-s official nickname, "Flowertown in the Pines." 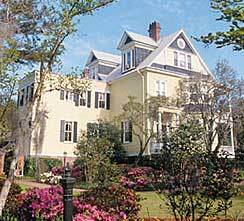 The term "Flowertown" points to Summerville-s other claim to fame, the annual Azalea Festival. This festival celebrates this beauty each spring with a town wide event that draws artists and craftspeople from all across the United States. Summerville has a growing population of over 30,000 and all the consumer amenities of any mid-sized American city. Golf courses, hospitals, shops and restaurants are all located in and around the city limits of Summerville. The Francis Beidler Forest, perfect for exploring the outdoors is nearby, as well as the Dorchester Museum, home to some of the oldest animal fossils ever discovered in South Carolina. For more information on Midland Terrace Condominiums contact us today!